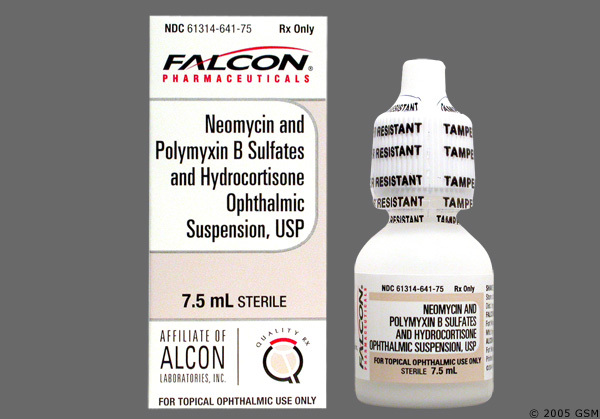 Neomycin and Polymyxin B are often combined with hydrocortisone to treat bacterial infections on the ear or in the eyes. These medications also provide relief for irritation, redness and discomfort. The drug needs a doctor's prescription and may be applied directly on the eyes (ophthalmic route) or the ears (otic route). The solution works against bacterial infections. These drugs are not recommended for viral infections or fungal infections. If prescribed, complete a full course of treatment. If not, your infection may not clear up completely. It can also cause bacteria to become less sensitive to the medicine, which could make it more difficult to treat the infection in the future. Remember also that repeated or long-term use of the solution may cause the development of a second infection. Inform your doctor if this occurs because your treatment may need to be changed. Consult your doctor if your symptoms do not improve within 7 days or if they seem to get worse. Do NOT use a larger dose than recommended or use for the medication longer than 7 days without your doctor’s advice. Some products contain substances like sulfites which can cause an allergic reaction. Ask your pharmacist if the product you are buying has sulfites in it. Inform your doctor/dentist if you are using Neomycin and Polymyxin B before receiving any emergency care, medical/dental care or surgery. Use with extreme caution in children less than 2 years old. Theeffectiveness and safety of these medications have not been confirmedin children. Tell your doctor if you are pregnant or are breastfeeding. Discuss the risks and benefits of using the solution during pregnancy and lactation. Use the solution 3 to 4 times a day, or as directed by your doctor. Clean and dry the ear canal before applying this medication. It is best to ask another person’s help in applying the solution in the form of ear drops. It is also good to warm the solution by holding the bottle in your hand for a few minutes. This helps prevent dizziness when the drops are applied to your ear. Wash your hands before applying the drops. Avoid touching the dropper tip or letting it get into contact with any surface. Shake the bottle before using it. To apply on your own, lie on one side so that the infected ear is on the upper side. Hold the Neomycin and Polymyxin B dropper over your ear and apply the appropriate number of drops. Hold your earlobe backward and keep your head tilted for five minutes. You may also insert a cotton plug. Another technique to apply the medication is to place a cotton wick moistened with the medication into your ear. Replace once a day. After using the dropper, do not rinse. Replace its cap. For maximum effect, it is best to use the medication regularly and to apply it on schedule. Continue using, even if your symptoms disappear until the full course of treatment is finished. Wash your hands before using the medication. Tilt your head backwards and then pull your lower eyelid down to make a pouch. Apply the eye drops into the eyelid pouch and close your eyes without blinking. Keep them closed for a couple of minutes so that the medicine gets in contact with the infected eye. Apply another drop if you think some of the medicine doesn't get into your eye properly. Avoid touching the applicator tip. Keep the bottle tightly closed. The dose is different for every patient. Follow the doctor's prescription or label directions. The dose, which includes the number of drops, the frequency and duration of use, may also depend on the medicine’s strength and the medical condition you have. If you miss a dose, apply drops at the same dose it as soon as possible. If it is almost time for the next dose, just skip the missed dose and continue the regular dosing schedule. For children, use according to the doctor’s instructions. A common side effect of ear drops is mild ear itching which may go away on its own. If you develop signs of allergic reaction, go to the ER or call your doctor immediately. These consist of hives, swelling of the face, tongue, lips or throat, and difficulty breathing.